Dr. David Pascal competed in track and field for UCLA and at the World Games, now he helps world- class athletes compete for Olympic gold. "Oh my gosh! He's going to get the silver medal! No way! Gosh that is my highlight right there. That is fantastic," Pascal exclaimed as he watched one of his clients, Leonel Manzano, win silver in the 1,500-meter race Tuesday. 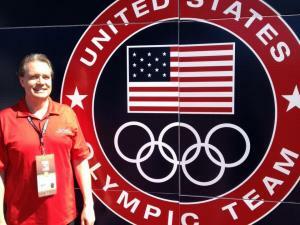 This summer, Pascal has traveled from his chiropractic offices in Cary, North Carolina to Olympic training facilities as he assists athletes as they prepare for their Olympic events. "When these kids win a medal, their lives are changed because forever they are an Olympic medalist," said Pascal. "Especially a kid like Leo, he's so involved with his community in Austin, Texas. He tells them ‘I'm out here doing my best and you can too.'" Track and field is Pascal's passion. His athletes have won a total of 35 gold, silver and bronze medals in the last two Olympic Games and four World Track & Field Championships while under his care. And the number continues to increase this week in London. "It's so pretty how the city decorates itself up; it's really neat to see," said Pascal about attending the Olympic games. "It's like Disney World. It's totally different environment." But it is a lot of work. Pascal gets up at six or seven in the morning, he takes a bus to a training facility where he stays most of the day before he heads to the Olympic warm-up facility to treat the athletes. Pascal will finish around 11 o'clock at night and go back to the athletes' village, continuing treatments there until one or two in the morning. Then he gets the little sleep he can. Once the games are over, he will be back in the office Monday morning in Cary to treat his regular patients. Pascal will be back in the on the training tour when indoor track and field begins in January in preparation for the World Championships in Moscow next summer. Pascal uses a unique neurologic technique called NRCT™ "Neurologic Relief Centers Technique". Over the years he's worked with Justin Gatlin, who came back to compete in 2010 after a four-year ban from track and field for testing positive for a banned substance, LeShawn Merrit, Kellie Wells, Bernard Lagat and Aries Merritt, all Pascal clients, are also competing in London. "It's really incredible. There's two ways to go. You can volunteer and be a part of the official medical staff, you don't really necessarily know those athletes, or you can work on the circuit and be the athletes' personal chiropractor," said Pascal. "So I treat them all season long, hopefully all career long, when that happens you are taking a bigger role in how they perform. "We're there in support; we're there to help regulate their bodies so they can perform to the best of their ability." One of Pascal's most rewarding experiences was treating Derek Miles at the Olympic trials. He went on to win bronze in Beijing. Miles had taken off two months due to an Achilles tendon injury and could barely run but wanted to qualify to compete. He got in touch with Pascal at the trials. "I said, 'how long do we have?' And he said two and a half days," recalled Pascal. "He came back, he qualified for the finals and said I'm completely pain free but I'm sore. Now I said, 'how long do we have?' He said another 2 and a half days. "There‘s a person I can definitely say, I really helped that guy," Pascal said.